Columbus Blue Jackets forward Nathan Horton underwent surgery to repair a shoulder injury he sustained during the 2013 Stanley Cup Final while he was with the Boston Bruins. The surgery was successful and it will keep Horton out of the lineup for 4-6 months. The surgery was performed by Dr. Jon Warner at the Boston Shoulder Institute at Massachusetts General Hospital. Blue Jackets fans officially have a timetable for their new star to join the team and make his debut. The best case scenario has Horton returning in November while a worst case scenario would leave the power forward sidelined until January. 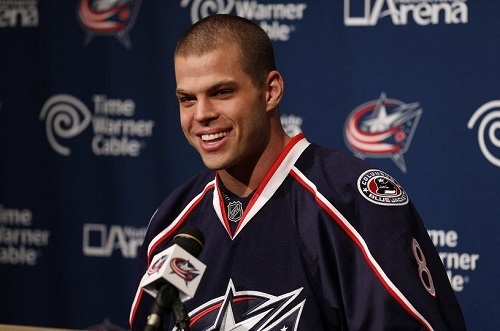 Nathan Horton after he signed a seven-year deal with the Blue Jackets. Blake Geoffrion officially announced his retirement as a hockey player this past week. Geoffrion retired due to a depressed skull fracture he suffered during an AHL game last season. The 25 year-old was the first fourth-generation player in the NHL when he made his debut with the Nashville Predators on February 26, 2011. He was later traded to Montreal and played 13 games with the club. His father Dan, grandfather Bernie and great-grandfather Howie Morenz, who is in the Hockey Hall of Fame, have all played for the Montreal Canadiens. One day after he announced his retirement the Blue Jackets announced that they had hired him as a pro scout. His responsibilities will cover most of the Midwest’s AHL and NHL teams. Geoffrion is currently planning his wedding which is scheduled for sometime within the next four weeks. Congratulations, Blake. The Blue Jackets have also announced that they have re-signed forward Spencer Machacek to a one-year, two-way deal worth $632,500 at the NHL level, according to capgeek.com. Machacek was traded to the Blue Jackets from the Winnipeg Jets in March. The 24 year-old played 18 games with the Springfield Falcons of the AHL, scoring five goals and nine assists. The team has also announced that they have come to terms with RFA David Savard. Savard has signed a one-year, two-way deal worth $709,275. The 22 year-old defenseman played four games with the Blue Jackets last season and sixty with the Springfield Falcons, where he registered 5 goals and 26 assists.